Pieris RR, Al-Sabti HA, Al-Abri QSA, Alam Rizvi SG. Prevalence Pattern of Risk Factors for Coronary Artery Disease among Patients Presenting for Coronary Artery Bypass Grafting in Oman. Oman Med J 2014 May; 29(3):203-207. Data on the etiology of CHD originate mainly from Europe and America.3 Precise details of the geographical variation of these factors are uncertain. Published studies have demonstrated that hypertension is the chief cause of CHD in Chinese4 and dyslipidemia is less associated with CHD among Indians.5 Though the actual risk factors are probably the same for various populations, it is well known that their order of prevalence varies.6 Though prevalence patterns of etiology for coronary heart disease in the Gulf region are encountered,7 articles dedicated to patients having surgical revascularization are not encountered. Oman has a population of 3,090,150, of whom 81.3% are native Omanis.8 There are two established centers that perform open-heart surgery in the country. The Royal Hospital Cardiothoracic Unit was opened in November 1990 and the Sultan Qaboos University Hospital (SQUH), which commenced its cardiac program in March 2008. 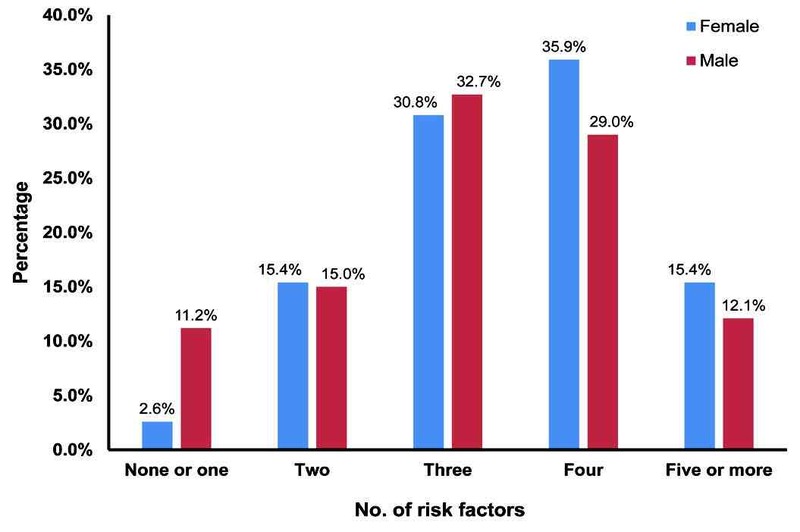 The objective of this study was to identify the pattern of prevalence of risk factors in patients presenting for surgical revascularization by coronary artery bypass grafting (CABG) to the Cardiothoracic Unit at SQUH. This would have close resemblance to a national trend. All patients presenting for coronary artery bypass grafting (as an isolated or combined procedure) to the unit from March 2008 to March 2010 were included in this study. The risk factors were obtained from the history and laboratory investigations and were presented as a retrospective single center descriptive study. In the study sample, eight conventional risk factors were analyzed. This included a history of cigarette smoking, dyslipidemia, hypertension, diabetes mellitus, advanced age, family history of CHD, obesity, and male gender. Cigarette smoking was determined by the history given by the patient and relatives. Dyslipidemia was defined using the adult treatment panel III of the National Cholesterol Education Programme.9 Advanced age was considered 60 years or more at presentation, based on the American Heart Association’s first age cut-off limit for CHD. Hypertension was defined using WHO criteria-pressure exceeding a systolic value of 140 mmHg and/or a diastolic of 90 mmHg. Any patients whose pressure was controlled by medication were also included in this group. Patients on anti diabetic drugs or having a fasting blood glucose level ≥7.0 mmol/L were considered to be diabetic. Obesity was defined as having a body mass index (BMI) of more than 30 kg/m2. Mental stress was not assessed in this study. A database for the study was created in IBM SPSS Statistics 20, and apart from drawing suitable charts, a Chi-square test was applied to test the significance of the association between the risk factors and gender. A p-value of 0.05 or less was considered as significant. During the 24-month period, 146 patients underwent CABG. Of these patients, 136 were Omani nationals (93%); 144 of these cases had isolated CABG; 107 patients were male (73%). The age ranged from 31 years to 87 years. Mean age = 58.18 ± 10.08 (Males: 56.81 ± 10.42, females: 61.95 ± 7.97). The prevalence of the eight analyzed risk factors were as follows: 119 patients (82%) had hypertension; 115 patients (79%) had dyslipidemia; 107 patients (73%) were male; 79 patients (54%) had diabetes mellitus; 70 patients (48%) were over the age of 60 years; 41 patients (28%) gave a history of smoking; 31 patients (21%) were obese; and 19 patients (13%) gave a positive family history (Fig. 1). We also analyzed how many risk factors were present in each patient. The distribution is given below in the bar diagram. Figure 1: Prevalence of risk factors in descending order. 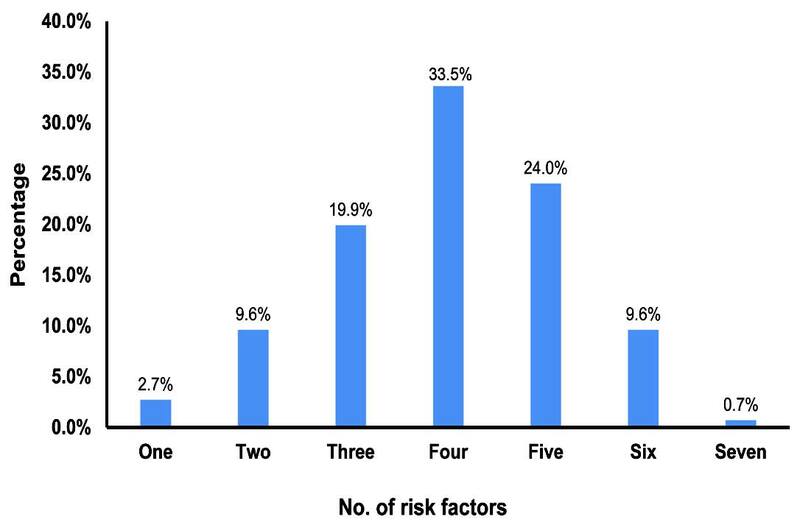 Figure 2: Prevalence of number of risk factor in the study group. The diagram shows that 96.6% of the sample had between 2 to 6 risk factors. Three patients (2.1%) had no identifiable risk factor other than being male. Although every combination of risk factors was identified in the sample, the most common combination was hypertension, dyslipidemia and diabetes in a male patient. None of the patients had zero or all risk factors. We further analyzed the distribution of seven risk factors among males and females (Table 1). Smoking and dyslipidemia were higher among males, but all the other risk factors were higher among the female population. 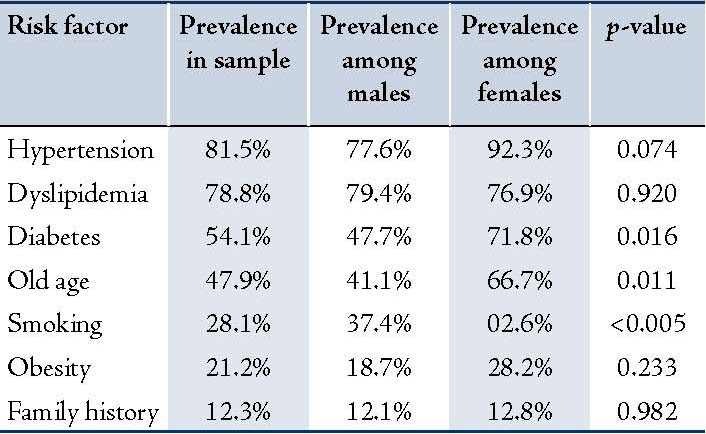 Table 1: Prevalence of risk factors (excluding male gender) as distributed among males and females. Figure 3: Percentage of number of risk factors (excluding gender) among males and females. Fig. 3 graphically displays the distribution of risk factors among males and females. For ease of display, we have used five groups to depict the results. In three out of the five groups, females had more risk factors. Furthermore, the females in this sample presented to hospital with a higher number of risk factors: 51% of females as compared to 41% of males were found to have more than three risk factors. In female patients, diabetes mellitus (males: 48%, females: 72%, p=0.016) and old age (males: 41%, females: 67%, p=0.011) exhibited a statistically higher prevalence. While statistically higher prevalence of smoking was seen in males (males: 28%, females: 3%, p<0.005). There are few studies from the Gulf dedicated towards identifying the prevalence of risk factors of CHD. This is the first study that identifies the pattern of prevalence for risk factors in patients undergoing CABG in Oman. Male gender was the third ranking risk factor. The distribution of the sexes has a wide variation around the world due to many reasons. According to Oman demographics profile of 2013, the male/female ratio was 1.22.8 In our study, (73% male) the male/female ratio was 2.74. This reflects that male gender is an important risk factor for CHD. Vast changes in lifestyle in the Gulf within the last four decades have been associated with increasing prevalence of diabetes.21 Furthermore, when compared to European populations; the observed rate of insulin resistance is higher in the Arabian Peninsula.22 This is thought to be genetically determined.22 Other unknown factors may be involved in the high prevalence of diabetes in Oman. In the current study, old age was the fifth ranking risk factor. In several older people, the date or year of birth was not known. It was merely an estimate and was given as 1/1/(year). This is a unique problem associated with our region. We have always tried to correct the age stated in the records, if it was not consistent with the age of the firstborn child. The mean age of the sample was 58.18 ± 10.08 years. The mean age for males was 56.81 ± 10.42 and 61.95 ± 7.97 for females. The age at presentation was higher for female patients. Smoking was our sixth ranking risk factor. Throughout the industrialized world, the two most prevalent risk factors are smoking and abnormal blood lipids.6 Despite the absence of tobacco control laws in Oman, the crude prevalence of smoking was as low as 7.0%,23 while despite having legislature to control smoking in Yemen, the incidence of smoking there was 23.7%.24 We presume that the low incidence of smoking in Oman is due to cultural reasons as opposed to Yemen where, despite legislature, smoking was the highest ranking risk factor. Obesity was the seventh most prevalent risk factor. Obesity is well known to cause the elevation of LDL and triglycerides with a decrease in HDL; it increases the incidence of hypertension, diabetes and metabolic syndrome, and it promotes atherosclerosis. It also increases the all cause mortality in most studied populations. Thus, obesity would indirectly increase the incidence of CHD. However, many studies have found that obesity is an independent risk factor for CHD.25-27 The prevalence of obesity in Oman is 16.7% in men and 23.8% in women.28 Based on these data, our sample of 73.29% males should have a calculated obesity incidence of 18.596%. The observed incidence of obesity in our sample was 21.23%, which is higher than this calculated figure, indicating that obesity has a direct influence on CHD. In population demographics, native Omanis constitute 81.32%. In our sample, Omani nationals constituted 93.15%.8 Several expatriates chose to have their CABG in their native land due to insurance issues, financial constraints and lack of family support. These exclusions would introduce some bias if we were to try to draw national parallels from our findings. Comparing our findings with other published reports of Shehab et al. in their publication of 2013, gender disparities in the presentation, management and outcomes of acute coronary syndrome patients - data from the 2nd Gulf Registry of Acute Coronary Events,34 they found that women in the Arabian Gulf were older when presenting with acute coronary syndrome. Their rankings would be male gender, hypertension, diabetes, smoking, dyslipidemia and family history; which differs from our own results. They also found that women were more likely to have a history of hypertension, hyperlipidemia or diabetes. Al-Rasadi et al. in their publication investigating the Omani subset of the Gulf registry of acute coronary events, found that diabetes, hyperlipidemia and hypertension were the leading causes of CHD in Oman.35 While Ganguly et al. in their article, reported that some risk factors for coronary heart disease among Omani males,36 mainly worked out odds ratios for developing CHD in the presence of risk factors. They found that hypertension, diabetes mellitus, a family history of CHD gave the highest odds ratios. In this study, the most prevalent risk factor was hypertension. Dyslipidemia was the second most common, followed by male gender, diabetes mellitus, old age, smoking, obesity and a positive family history. Also, 87.7% of patients had 3 or more risk factors. The females in this study were older than the males and had more risk factors at presentation. The most common combination of factors seen together was diabetes, hypertension, dyslipidemia and male gender. Our sample carried bias, due to being a hospital-based study and some patients choosing to seek treatment abroad. However, the results point to a unique trend. Larger population-based studies would be necessary to point towards a more accurate national trend for Oman. 1. Lloyd-Jones D, Adams R, Carnethon M, De Simone G, Ferguson TB, Flegal K, et al; American Heart Association Statistics Committee and Stroke Statistics Subcommittee. Heart disease and stroke statistics—2009 update. Circulation 2009 Jan;119(3):480-486. 2. World health rankings. Available at http://www.worldlifeexpectancy.com/country-health-profile/oman. Accessed March 10, 2013. 3. Yusuf S, Reddy S, Ôunpuu S, Anand S. Global burden of cardiovascular diseases: part I: general considerations, the epidemiologic transition, risk factors, and impact of urbanization. Circulation 2001 Nov;104(22):2746-2753. 4. Yusuf S, Reddy S, Ôunpuu S, Anand S. Global burden of cardiovascular diseases: Part II: variations in cardiovascular disease by specific ethnic groups and geographic regions and prevention strategies. Circulation 2001 Dec;104(23):2855-2864. 5. Pais P, Pogue J, Gerstein H, Zachariah E, Savitha D, Jayprakash S, et al. Risk factors for acute myocardial infarction in Indians: a case-control study. Lancet 1996 Aug;348(9024):358-363. 6. Yusuf S, Hawken S, Ôunpuu S, Dans T, Avezum A, Lanas F, et al; INTERHEART Study Investigators. Effect of potentially modifiable risk factors associated with myocardial infarction in 52 countries (the INTERHEART study): case-control study. Lancet 2004 Sep;364(9438):937-952. 7. Al-Huthi MA, Raja’a YA, Al-Noami M, Abdul Rahman AR. Prevalence of coronary risk factors, clinical presentation, and complications in acute coronary syndrome patients living at high vs low altitudes in Yemen. MedGenMed 2006;8(4):28. 8. Oman demographics profile 2013 at index mundi Available at http://www.indexmundi.com/oman/demographics_profile.html. Accessed November 1, 2013. 9. National Cholesterol Education Program (NCEP) Expert Panel on Detection, Evaluation, and Treatment of High Blood Cholesterol in Adults (Adult Treatment Panel III). Third Report of the National Cholesterol Education Program (NCEP) Expert Panel on Detection, Evaluation, and Treatment of High Blood Cholesterol in Adults (Adult Treatment Panel III) final report. Circulation 2002 Dec;106(25):3143-3421. 10. Kearney PM, Whelton M, Reynolds K, Whelton PK, He J, He J. Worldwide prevalence of hypertension: a systematic review. J Hypertens 2004 Jan;22(1):11-19. 11. Hasab AA, Jaffer A, Hallaj Z. Blood pressure patterns among the Omani population. East Mediterr Health J 1999 Jan;5(1):46-54. 12. Al Riyami A, Elaty M A A, Morsi M, Al Kharusi H, Al Shukaily W, Jaju S. Oman World Health Survey: Part 1 - Methodology, Sociodemographic Profile and Epidemiology of Non-Communicable Diseases in Oman. Oman Med J 2012;27- 5: 425-443. 13. El-Reshaid K, Al-Owaish R, Diab A. Hypertension in kuwait: the past, present and future. Saudi J Kidney Dis Transpl 1999 Jul-Sep;10(3):357-364. 14. Ashour Z, Ibrahim MM, Appel LJ, Ibrahim AS, Whelton PK; The NHP Investigative Team. The Egyptian National Hypertension Project (NHP). Design and rationale. Hypertension 1995 Dec;26(6 Pt 1):880-885. 15. Al-MAqbali AA. Temple-Smith MT, Ferler J, Blackberry I. Prevalence and Determinants of Pre-Hypertension among Omani Adults Attending Non-Communicable Disease Screening Program in Primary Care Setting in Sohar City. Oman Med J 2013 Sept; 28(5):316-323.Al-Sabti H, Al-Rasadi KH, Mukaddirov MM, Al-Hinai AT. Prevalence and pattern of dyslipidemia in Omani patients undergoing coronary artery bypass surgery. J Clin Lipidol 2010;3:201-202. 16. Al-Sabti H, Al-Rasadi KH, Mukaddirov MM, Al-Hinai AT. Prevalence and pattern of dyslipidemia in Omani patients undergoing coronary artery bypass surgery. J Clin Lipidol 2010;3:201-202 . 17. Wild S, Roglic G, Green A, Sicree R, King H. Global prevalence of diabetes: estimates for the year 2000 and projections for 2030. Diabetes Care 2004 May;27(5):1047-1053. 18. Al-Lawati JA, Al Riyami AM, Mohammed AJ, Jousilahti P. Increasing prevalence of diabetes mellitus in Oman. Diabet Med 2002 Nov;19(11):954-957. 19. Al-Moosa S, Allin S, Jemiai N, Al-Lawati J, Mossialos E. Diabetes and urbanization in the Omani population: an analysis of national survey data. Popul Health Metr 2006;4:5. 20. Diabetic cases rise at alarming rates – a press statement by the Oman diabetic association. Oman daily observer available at http://main.omanobserver.om/node/117642. Accessed on March 10, 2013. 21. Al-Mahroos F. Diabetes mellitus in the Arabian peninsula. Ann Saudi Med 2000 Mar;20(2):111-112. 22. Al-Harbi EM, Abbassi AJ, Tamim H, al-Jenaidi F, Kooheji M, Kamal M, et al. Specific HLA-DRB and -DQB alleles and haplotypes confer disease susceptibility or resistance in Bahraini type 1 diabetes patients. Clin Diagn Lab Immunol 2004 Mar;11(2):292-296. 23. Al Riyami AA, Afifi M. Smoking in Oman: prevalence and characteristics of smokers. East Mediterr Health J 2004 Jul-Sep;10(4-5):600-609. 24. World health organisation - Tobacco control country profiles. Available at http://www.who.int/tobacco/surveillance/policy/country_profile/en/index.html. Accessed on March 10, 2013. 25. Hubert HB, Feinleib M, McNamara PM, Castelli WP. Obesity as an independent risk factor for cardiovascular disease: a 26-year follow-up of participants in the Framingham Heart Study. Circulation 1983 May;67(5):968-977. 26. Abbasi F, Brown BW Jr, Lamendola C, McLaughlin T, Reaven GM. Relationship between obesity, insulin resistance, and coronary heart disease risk. J Am Coll Cardiol 2002 Sep;40(5):937-943. 27. Zalesin KC, Franklin BA, Miller WM, Peterson ED, McCullough PA. Impact of obesity on cardiovascular disease. Endocrinol Metab Clin North Am 2008 Sep;37(3):663-684, ix. ix. 28. Al-Lawati JA, Jousilahti PJ. Prevalence and 10-year secular trend of obesity in Oman. Saudi Med J 2004 Mar;25(3):346-351. 29. Boer JM, Feskens EJ, Verschuren WM, Seidell JC, Kromhout D. The joint impact of family history of myocardial infarction and other risk factors on 12-year coronary heart disease mortality. Epidemiology 1999 Nov;10(6):767-770. 30. Li R, Bensen JT, Hutchinson RG, Province MA, Hertz-Picciotto I, Sprafka JM, et al. Family risk score of coronary heart disease (CHD) as a predictor of CHD: the Atherosclerosis Risk in Communities (ARIC) study and the NHLBI family heart study. Genet Epidemiol 2000 Mar;18(3):236-250. 31. Hawe E, Talmud PJ, Miller GJ, Humphries SE; Second Northwick Park Heart Study. Family history is a coronary heart disease risk factor in the Second Northwick Park Heart Study. Ann Hum Genet 2003 Mar;67(Pt 2):97-106. 32. Friedlander Y, Siscovick DS, Weinmann S, Austin MA, Psaty BM, Lemaitre RN, et al. Family history as a risk factor for primary cardiac arrest. Circulation 1998 Jan;97(2):155-160. 33. Williams RR, Hunt SC, Heiss G, Province MA, Bensen JT, Higgins M, et al. Usefulness of cardiovascular family history data for population-based preventive medicine and medical research (the Health Family Tree Study and the NHLBI Family Heart Study). Am J Cardiol 2001 Jan;87(2):129-135. 34. Shehab A, Al-Dabbagh B, AlHabib KF, Alsheikh-Ali AA, Almahmeed W, Sulaiman K, et al. Gender disparities in the presentation, management and outcomes of acute coronary syndrome patients: data from the 2nd Gulf Registry of Acute Coronary Events (Gulf RACE-2). PLoS One 2013;8(2):e55508. 35. Al-Rasadi K, Sulaiman K, Panduranga P, Al-Zakwani I. Prevalence, characteristics, and in-hospital outcomes of metabolic syndrome among acute coronary syndrome patients from Oman. Angiology 2011 Jul;62(5):381-389. 36. Ganguly SS, Al-Shafaee MA, Al-Maniri AA. 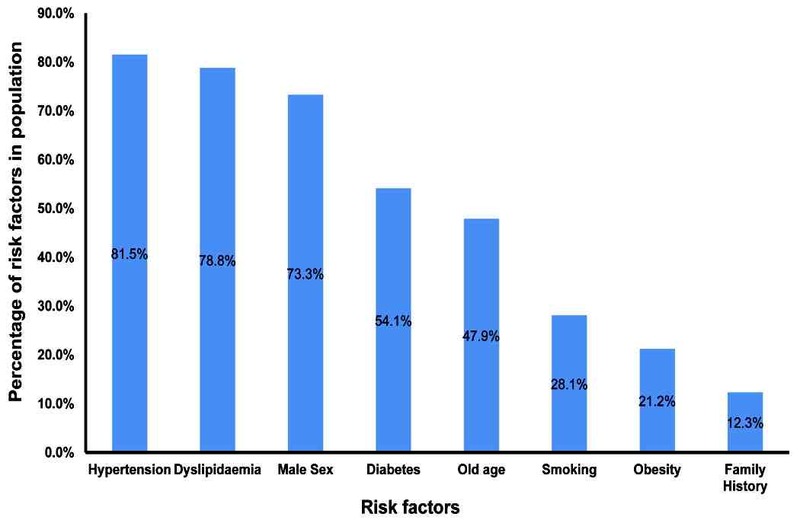 Some Risk Factors for Coronary Heart Disease among Omani Males: A matched case-control study. Sultan Qaboos Univ Med J 2008 Mar;8(1):45-51.